How do I get credentials to create a connection to Listrak's Email API? In order to set up a Listrak connection in Funnel, you will need a Client ID and a Client Secret. 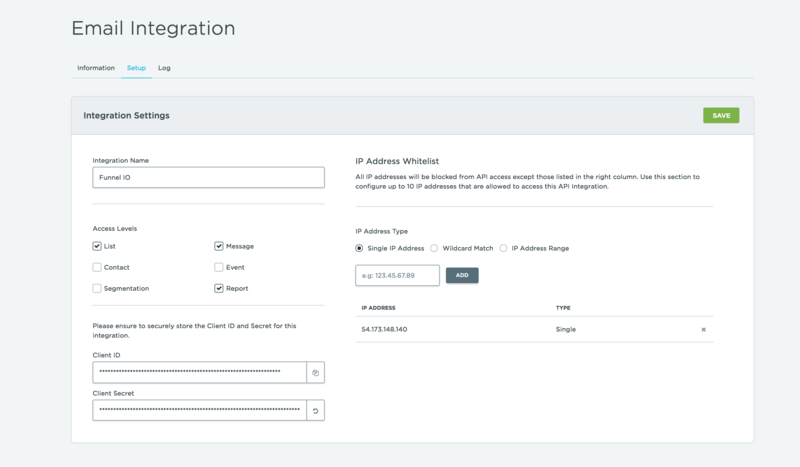 To generate these API credentials, login to Listrak and go to Manage -> Integrations and click Email API. Under IP Address Whitelist select Single IP Address as IP Address Type and enter the IP: 54.173.148.140. Now it should look like the screenshot below and you can copy the Client ID and Client Secret. The Client Secret will only be visible right after creating it so remember to save it somewhere.